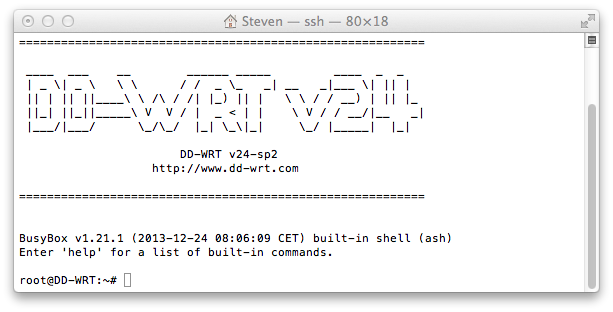 DD-WRT - Connect with SSH - Steven B.
DD-WRT is a Linux-based alternative open-source firmware suitable for a great variety of WLAN routers and embedded systems. The main emphasis lies on providing the easiest possible handling while at the same time supporting a great number of functionalities, here is how to enable the SSH functionality. SSH is now enabled on your router. *If SSH is greyed out, enable SSHd under the “Services” Tab. Now you can log in with username “root”, the password will be the same as the password in de web interface. You are now connected to your router. This entry was posted in DD-WRT and tagged ddwrt, ddwrt.com, enable, enable ssh, guide, help, installation, interface, lan, putty, router, ssh, switch, terminal, tutorial, webgui, winscp. Bookmark the permalink. Thanks. Having to use root as a username threw me off for 10 frustrating minutes until I found this.